Tooling and optics tolerances are tightly linked since achieving the latter requires the former. We build all tooling in house, including molds to produce lenses as small as 0.5 mm, which requires tolerances of a quarter of a fringe. Tolerances, however, are significantly affected by the overall design and the choice of materials. 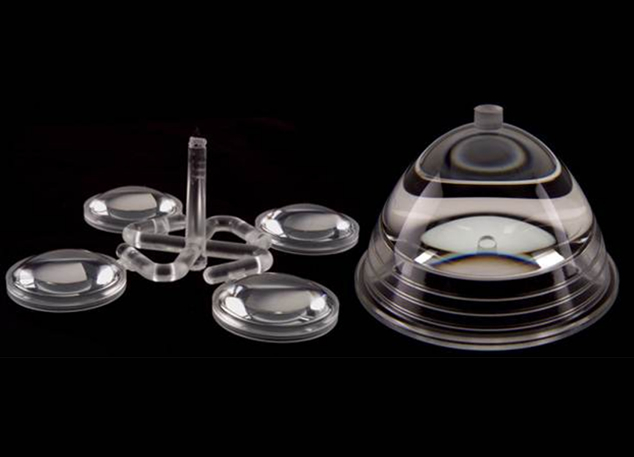 Our production, design and assembly of plastic optics components and assemblies must support tolerances limited only by the physical properties of the best engineering polymers on the market. It’s not uncommon to have to consider the effects of thermal expansion caused by merely holding a material in your hand. Solving these needs regularly has made Syntec expert in adapting individual parts, and ultimately whole assemblies, for success. In contrast, many precision drive train components have wider tolerances on the order of +/- 0.0001 in. With this commitment to the right tolerances, our customer base continues to shift from single components to complete assemblies — evidence of strong confidence in our total solution approach.